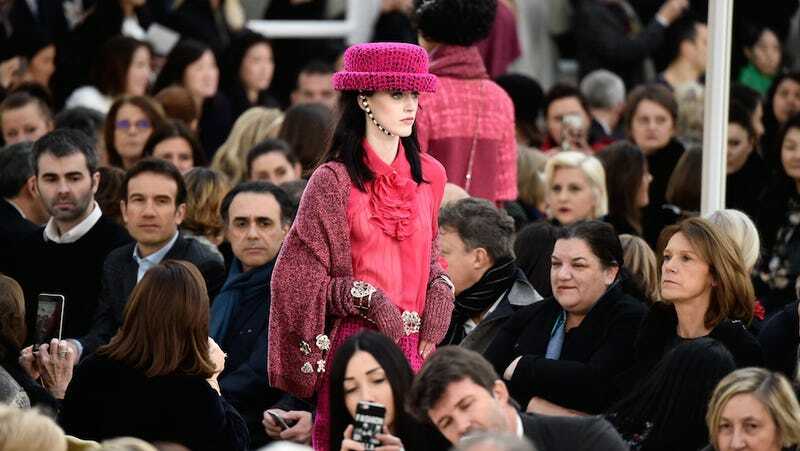 Today at Chanel, Karl looked to the traditional ponchos and hats and slouchy pants of the Argentinian gaucho and gussied it up with silver and pearls and cute little hat brims that make a cowgirl’s work that much daintier. If only they’d ridden in on horses, which apparently they needed as the runway was the equivalent of a mile—its theme was “Front Row Only” and guests sat in long rows of chairs set up so everyone could frow. Scarves and shawls were functional, though it doesn’t get so dusty in Paris. Kendall, Gigi, Lindsey—Karl’s faves looking like sweet dolls, home on the range.